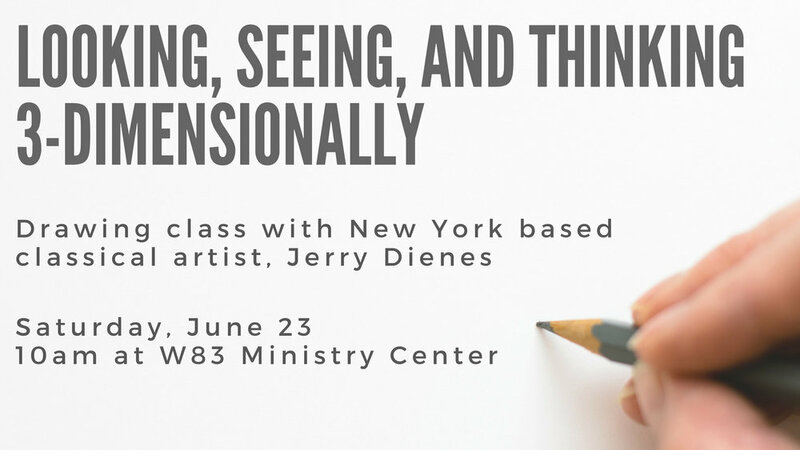 A drawing class with New York classical artist, Jerry Dienes. Trained at the Columbus College of Art & Design, Dienes paints and draws in the style of classical realism. He has taken classes at the New York Academy of Art and The Printmakers Workshop, studied figure painting with Jacob Collins at The Water Street Atelier, and drawing with Dan Thompson, Michael Grimaldi, and Ephraim Rubenstein at the Art Student’s League. He has most recently studied part-time with Justin Wood at the Grand Central Atelier in New York. Join us at 10am for coffee and tea in the gallery where you can view his current exhibit "Niggle's Studio: Leaf Paintings," then head up to a classroom for the workshop. He will offer instruction on still-life drawing for beginners and intermediate artists who are interested in exploring new ways of seeing ordinary objects and learning/practicing proper techniques for holding a pencil. Looking: being humbled before the object vs. drawing an archetype. Seeing: evaluating the direction, strength and character of the light on the object. Properly viewed, a simple apple will offer much to consider, more than can be contained even in a one hour class.